Yi Technology unveiled the Yi 4K+ action camera at CES 2017 earlier this year, but the GoPro Hero5 Black rival is only now going on sale. Its claim to fame? 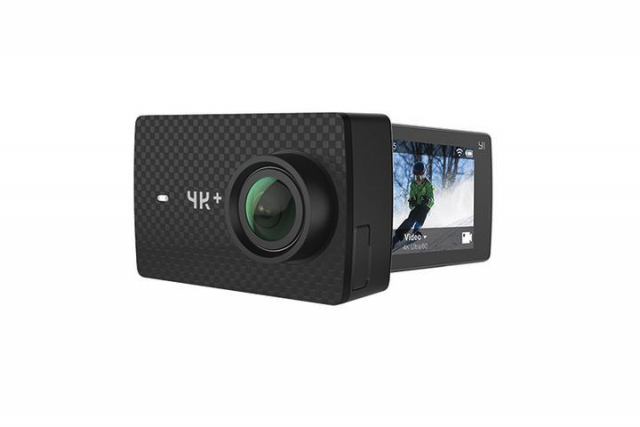 The Yi 4K+ is the first action camera to offer 4K video recording at 60FPS. The Yi 4K+ clearly outclasses GoPro's Hero5 Black in this regard, as the latter is only capable of 4K video recording at 30FPS. For users who want to shoot sports or fast-moving objects, the extra frames can make a huge difference in terms of smoothness. The new Yi Technology action camera is based on the Yi 4K chassis, but, compared to its predecessor, the main difference in terms of hardware is the move to a Ambarella H2 processor. We have another first here as well, as the Yi 4K+ is the first action camera to use this chip. The new processor is the reason why Yi Technology is able to double the framerate at 4K compared to the Yi 4K and the GoPro Hero5 Black, and offer a maximum bitrate of 120Mbps. The Ambarella H2 is also energy-efficient, as the company says that users can expect to record up to 71 minutes of video using the 4K 60FPS mode. There is also electronic image stabilization on board, which, however, only works in 4K up to 30FPS (it's available on lower resolutions too). It will be interesting to see how it works in practice; based on my experience, action cameras tend to struggle when EIS is enabled, severely limiting the field of view and delivering lower quality videos too. Other attractive features of the Yi 4K+ are the support for RAW images, voice commands, and live streaming. It's clear that Yi Technology is gunning for GoPro's Hero5 Black, as it offers all three features too. However, on the Yi 4K+ these will only be available through an upcoming firmware update, not out of the box. Unsurprisingly, it also has a USB Type-C port, just like the GoPro Hero5 Black. How much does it cost? Yi Technology officially sells the Yi 4K+ in US for $339.98, as part of a bundle which includes a waterproof case. You can also get it without a case for $299.45 from its store on Aliexpress (if you use the Aliexpress app, it's $290.77). Yi Technology says that it is available from Amazon too, but it is not yet listed at the time of writing this article. It is worth noting that the Yi 4K+ is backwards compatible with the Yi 4K waterproof case, so if you are looking to upgrade you can save some money by reusing the case. It also works with the Yi 4K gimbal, as well as a new one that's designed for the Yi 4K+.